Micrometer-scale, high-precision Magnesium (Mg) isotopic analyses provide essential information regarding the timing of early solar system events. The simultaneous detection system available on the large-geometry SIMS provides key advantages for such analysis: optimized precision, better useful yield, higher analysis throughput... Its multicollector system is renowned for its field-proven reliability. Its five movable collector units cover a large mass range, from Lithium to Uranium isotopes, while its state-of-the-art detectors, Electron Multiplier or Faraday cup, provide excellent stability with low background. 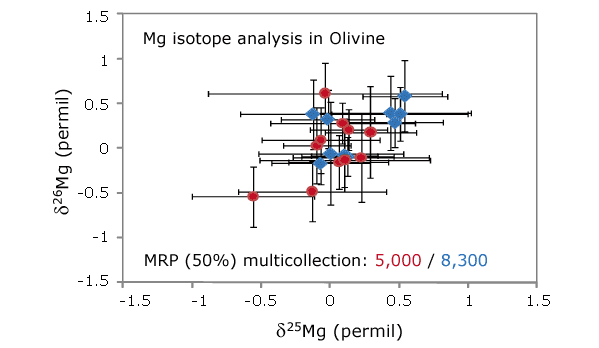 The above graph shows that an excellent repeatability can be obtained for the δ25Mg and δ26Mg ratios measured in multicollection mode at very high mass resolution (San Carlos standard Olivine sampe). A reproducibility of 0.2 - 0.3 permil (1δ) could be achieved, the same performance being obtained when increasing the mass resolution from MRP~5,000 to ~8,300. This demonstrates that high precision can be routinely achieved in multicollection mode using very high mass resolution conditions. Data courtesy of CRPG Nancy, France.